I am bringing you my first official "new" post of 2013! It still seems very strange to actually write 2013.. I kind of like it though.. anyways! Just a really quick post with no nail art activity.. Just sharing two cool polish. One of which I maaaaade! 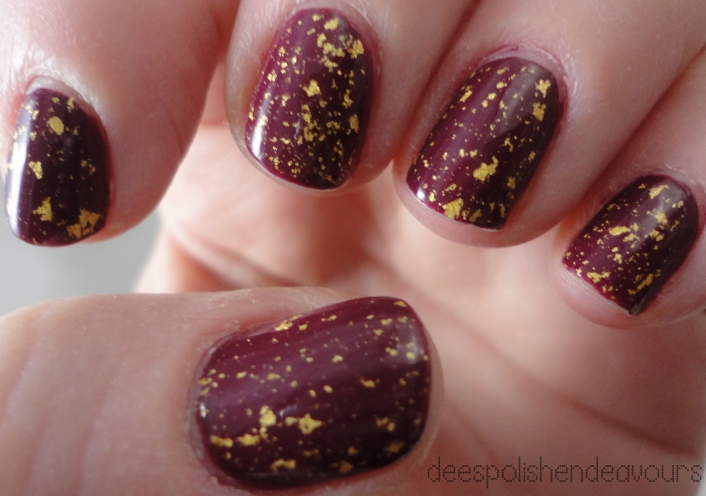 I started off with OPI Casino Royale, which, I am not sure if my top coat of the gold kind of altered the shade a bit.. it seems more red-toned in these photos, but it is a beautiful polish no matter what! I think this is what I wanted Essie Bahama Mama to be..
Then I decided to add my own gold leaf top coat. I just tweeze-d (super scientific method) a part pieces of gold leaf and added them to a suspension base.. but still! I made this! And I think it is lovely! And it wasn't very fun to make! I am really excited about the nail that I am planning to do tonight. I've had this photo saved for awhile now and I feel like today is the day to do them. I just have to clean my make-up brushes first.. then it is "me" time! Have a great night everyone, see you again soon! !